Gifting them is not only good party manners but also, a gift strengthens your bond with your friends regardless of whether it is gifted during a birthday, Christmas, a wedding, anniversary or a house warming party among others. Besides the gifts given by the guests to the hosts, there are also return gifts which the hosts may decide to give to the guests as they are leaving to show their appreciation of their willingness to attend the party and celebrate alongside them. The best housewarming gifts are those designed to assist the home/apartment owner in decorating the new place and making it cosy. Home décor items, kitchenware, dinnerware, gift baskets, handcrafted items or electronics make for a great housewarming gift. However, the real nail-biter is finding great house warming return gifts in USA, UK, worldwide. First popular in India where the hosts gave return gifts for house warming, these are a great way to show your appreciation. While they should not be very expensive or involving, return gifts are nevertheless a great way to transform your party. These are great gifts as you can rarely go wrong when giving handicrafts as return gifts especially to a number of people. It is a great way to create a bond with your guests as every time they see the handicraft; they will remember how they got it from your house warming party! 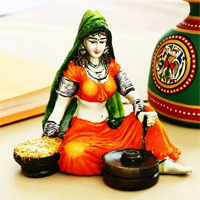 Indian Handicrafts Items can be marble, wooden, gemstone or oxidised. They can also be simply carved or elaborate and you can buy handicraft items online in sites such as boontoon.com, saving you the hassle of going to physical locations to choose. Home Décor Items: Home décor items can be paintings, handmade items such as flower vases, key hangings, tea coasters, magazine holder, decorative marble plate, photo frames, serving tray, lamps etc.. that can make a great housewarming gift. Wall Hangings: Wall hangings such as wall clocks, decorative hangings for good Vastu, brass marshal etc..as they are available in a wide eclectic variety of designs, sizes, shapes and pricing. Useful Gift Items: These are items that your guests will find useful to use in their respective homes. 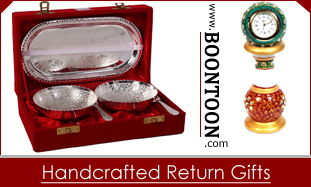 They can be items such as tea coasters, the popular gorgeous German silver bowl/glass sets, pooja thali, jewellery box, office set, dry fruit box etc. Dinnerware: Assemble the ideal table setting of your loved one who is moving to their new residence with dinnerware sets such as dinner plates & dish sets etc..
Home & Kitchen Appliances: Like induction cooktop, electric kettle, mixer grinder, hand blender, microwave oven etc..But these items may be bit expensive.